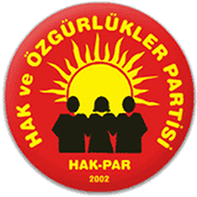 Rights and Freedoms Party (HAK-PAR) is a pro-Kurdish political party founded in 2002. HAKPAR distances itself from the dominant political pro-Kurdish political line currently represented by HDP. The party mainly promotes rights and freedoms for Turkey’s Kurds and supports a federal structure for Turkey.